Hello Homosapiens... As I look around my house and notice that I haven't used my juicer in over a year I realised that I don't really eat much fruit. Why? Because I can't be bothered and rather just drink the store bought stuff that say their "All so good for you". But really? After weeks of studying and training in food hygeine and saftey, nutrional value and all that I found out just like canned tuna and other canned foods, fruit juices are basically cooking in their cartons before you get them, not to mention you will never know how long it take for the fruit to come from the farms, be juiced, arrive in store ready for you to pick up. So Here in the UK I have now joined a fruit and vegetable mail order on a weekly basis Abel&Cole. Getting fresh fruit and vegetables every thursday is great, what i don't cook I juice, for the simple fact that I rather get my five a day in a quicker way in my busy life, kowing that my juice has not been cooked. 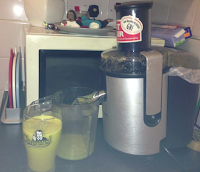 I'm pro juicers and I never plan to put mine away and down again. I've seen such a difference in my energy and so have my staff, I'm literally bouncing off the walls and that's me when I've just woken up from a good dewrinkling session. Check back for my recipes soon.